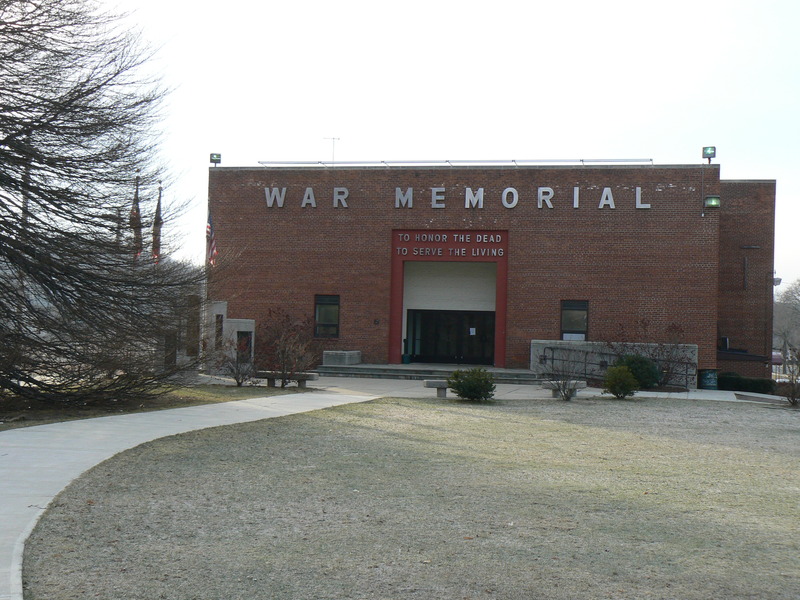 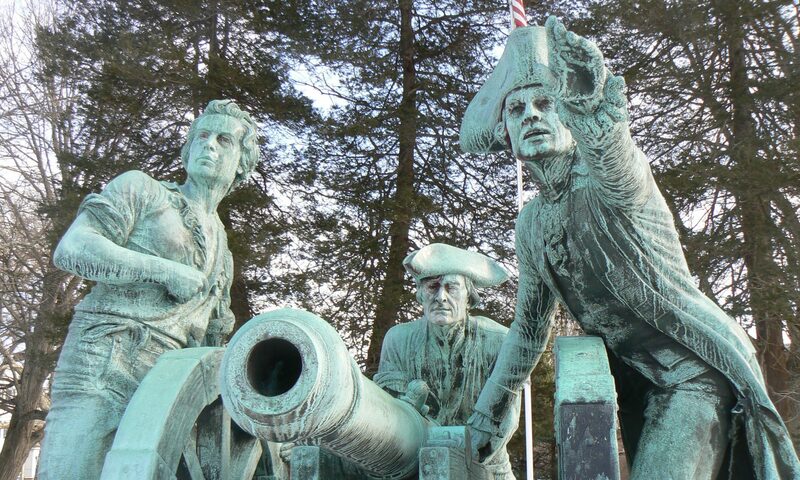 A collection of monuments near the War Memorial community center and gym in Danbury honor the service and sacrifice of local veterans and war heroes. 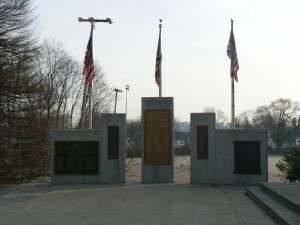 The War Memorial, built in 1951 near the entrance to Rogers Park, was dedicated “to honor the dead [and] to serve the living.” The facility offers recreational facilities and community events, and the grounds in front of the building feature memorials to the World Wars, Vietnam and Korea, and honor two local recipients of the Medal of Honor. 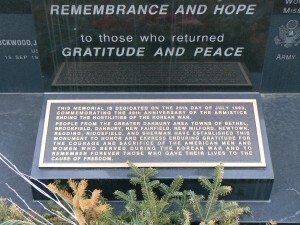 Near the War Memorial entrance are five plaques honoring those who served in the major wars since World War I. 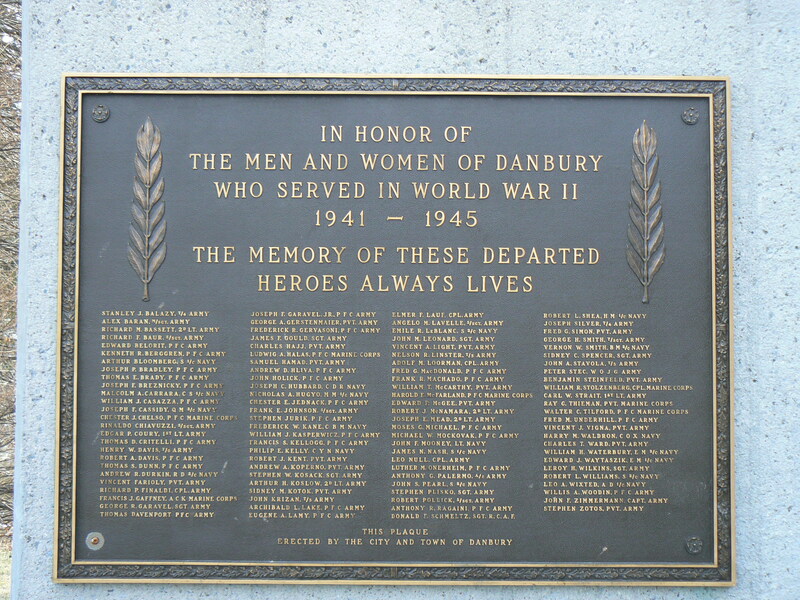 Starting at the visitor’s left, the first plaque bears the dedication “In honor of the men and women of Danbury who served in World War II 1941-1945 The memory of these departed heroes always lives,” and lists the names of 103 residents lost in the war. 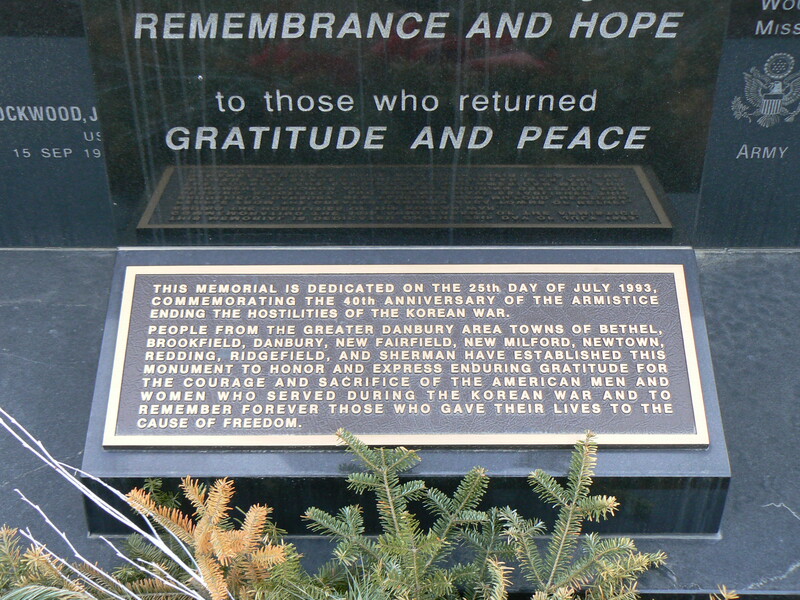 The next monument to the right lists a dozen names of people from Danbury and surrounding towns who died in the Korean War. 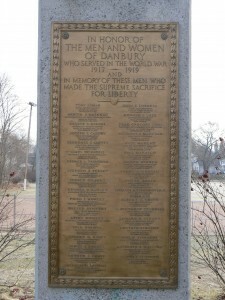 In the center of the monument collection is a plaque dedicated “In honor of the men and women of Danbury who served in the World War 1917-1919 And in memory of these men who made the supreme sacrifice for liberty.” The plaque lists the names, service affiliation, and the date and location of death, of 35 men. The nearby Vietnam memorial lists the names of 59 men from Danbury and other towns who were killed or reported missing in the war. The monument on the visitor’s far right also honors World War I veterans, and was erected by the Danbury High School alumni association to honor graduates who served in the war. 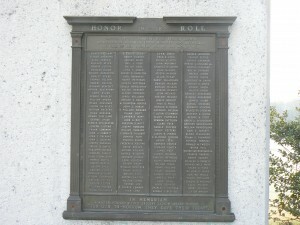 Four columns of names are listed, and three graduates who died in the war are honored separately on the plaque (as well as on the other World War I memorial). Near the north end of the grounds in front of the War Memorial is a 1988 monument honoring the service of men and women from the region in the Vietnam War. 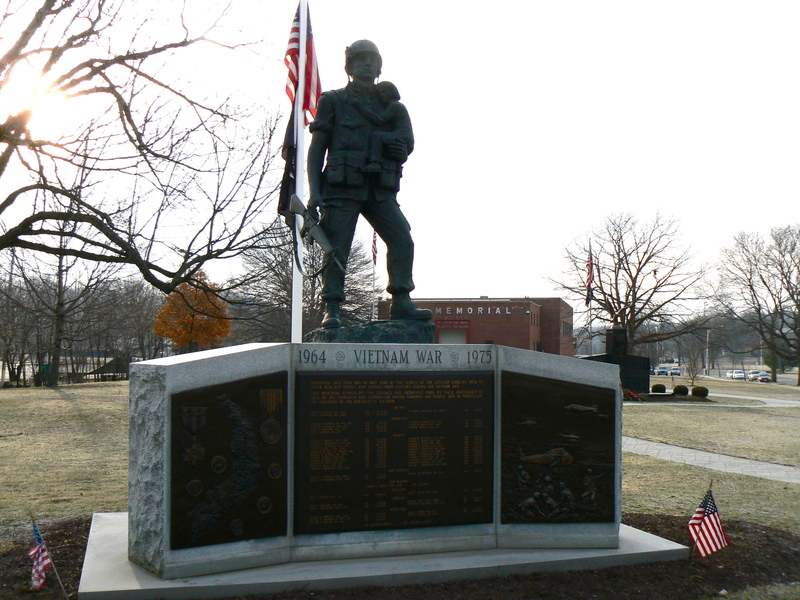 The monument is topped by a statue of an infantry soldier cradling a young girl. 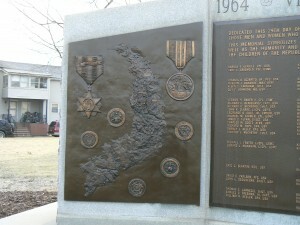 The soldier is mounted on a granite base with three bronze plaques. 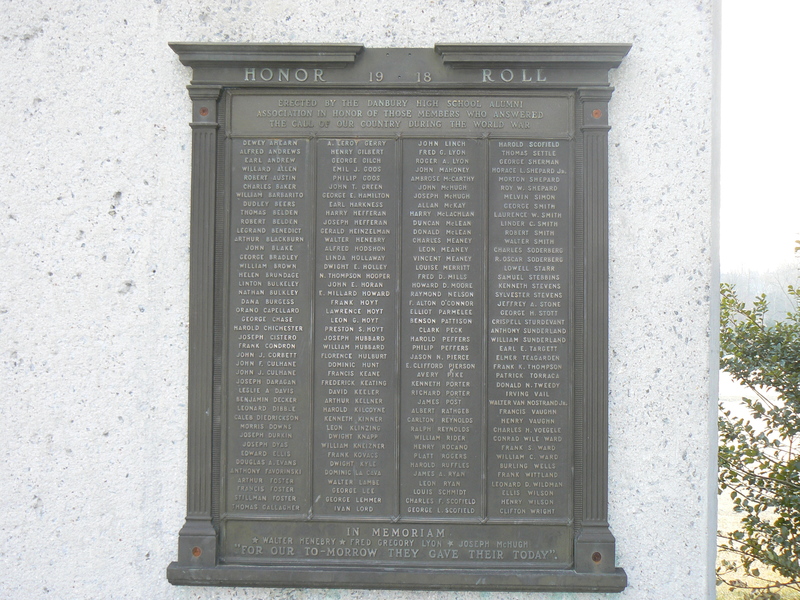 The central plaque lists the names of 47 men from Danbury and the towns of Bethel, Brookfield, New Fairfield, New Milford, Newtown, Redding and Ridgefield who were lost in the conflict. 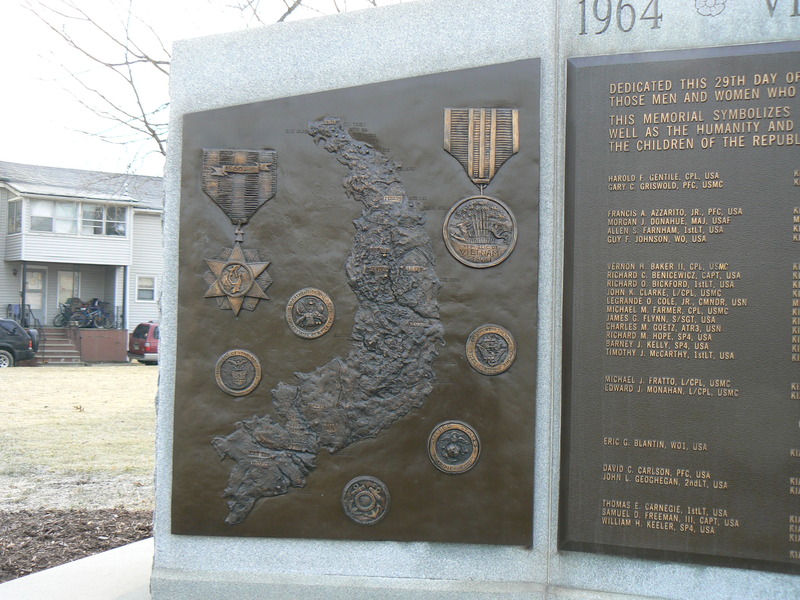 The plaque on the left depicts a map of Vietnam and service medals, and the right plaque depicts a medical evacuation scene. 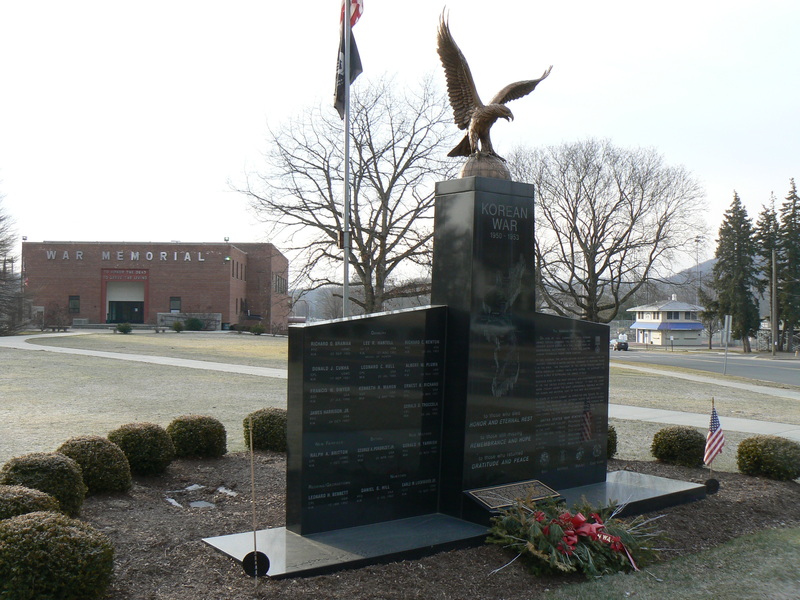 We were impressed at the gesture made by Danbury veterans to honor their colleagues from neighboring towns on the Vietnam and Korea monuments. The left panel honors the memory of war heroes from Danbury, New Fairfield, New Milford, Bethel, Redding and Newtown, and the right panel has an explanation and statistics that educate visitors about the war. Two smaller nearby monuments honor local heroes who have been awarded the Congressional Medal of Honor, and several trees commemorate the Sept. 11 victims and local residents who have made a variety of civic contributions to Danbury.